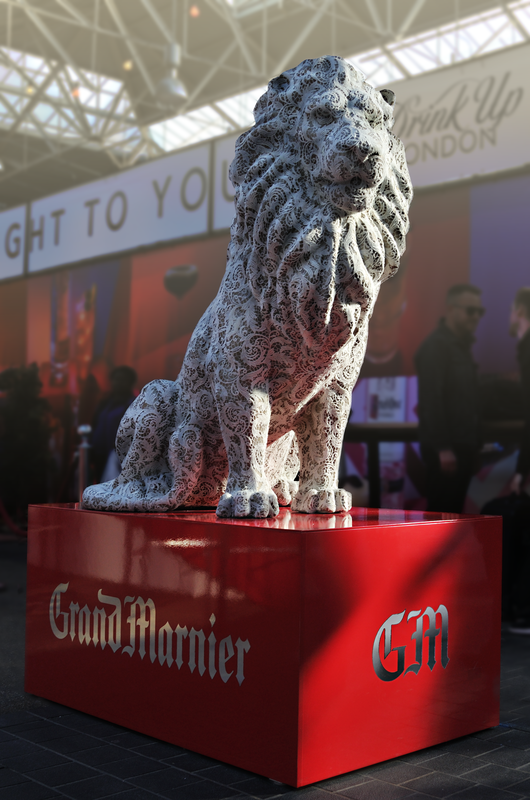 For JWT London: To SuperHuge 3D print a large lion sculpture and develop a patterned, textured finish taking inspiration from the work of Joana Vasconcelos to to give the lion a high-end feeling of bespoke art. The sculpture also needed to be Class1 Fire rated, robust and durable. 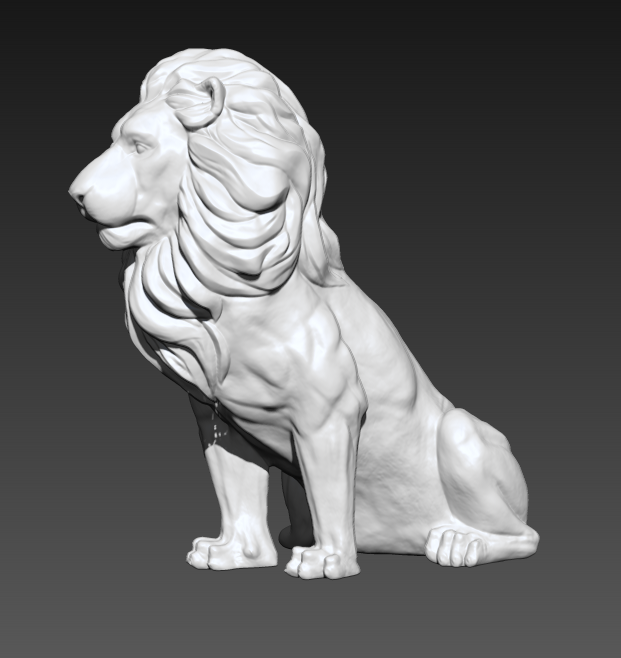 The incredible 3D file warehouses online are a bottomless resource and meant our client could simply supply us with an $8 model they found at https://www.cgtrader.com. 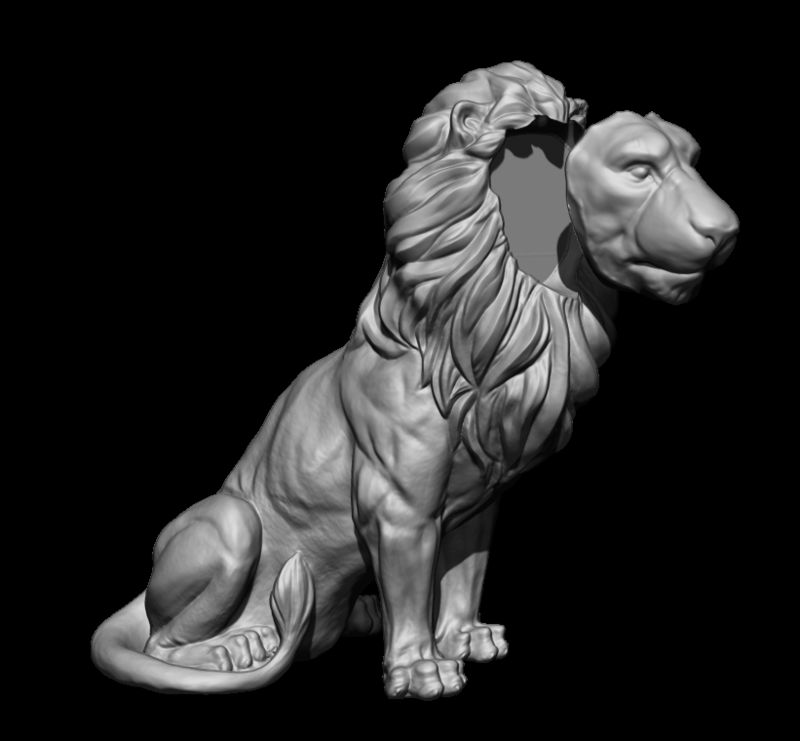 We were able to move immediately to pre-processing of the file ready for SuperHuge 3D printing. We took the file and removed the face and ears so they could be processed separately and 3D printed in ABS. Printing in ABS would retain the detail that would be difficult to maintain in the polystyrene. We also integrated structure through the front legs so channels were created as part of the SuperHuge 3D print. The high density polystyrene layers are fused together using our proprietary H-OLM system, ready for hand smoothing. You can see the 10mm resolution - this shows how SuperHuge works better the larger the object is, as it reduces the amount of detail to recover in the smoothing part of the process. Polyurethane spray coating is 1-2mm of super-tough, durable resin. Creating a class1 fire-rating and adding longevity to the model. The coated lion is then filled and sanded smooth ready for the gold topcoat. Once the lion was prepped, he was then taken into the spray booth and given a RAL matched topcoat in preparation for the lace encapsulation. The lace encapsulation process was developed alongside the SuperHuge production so we could push the boundaries and create the most unique, inspiring finish possible. The lace needed to be encapsulated so if there were any spillages at the event, it would be possible to clean the surface. Under four weeks from order to delivery, the SuperHuge 3D Print process buys time and peace of mind - The simplicity of working from a 3D file that has been signed off on day 1.